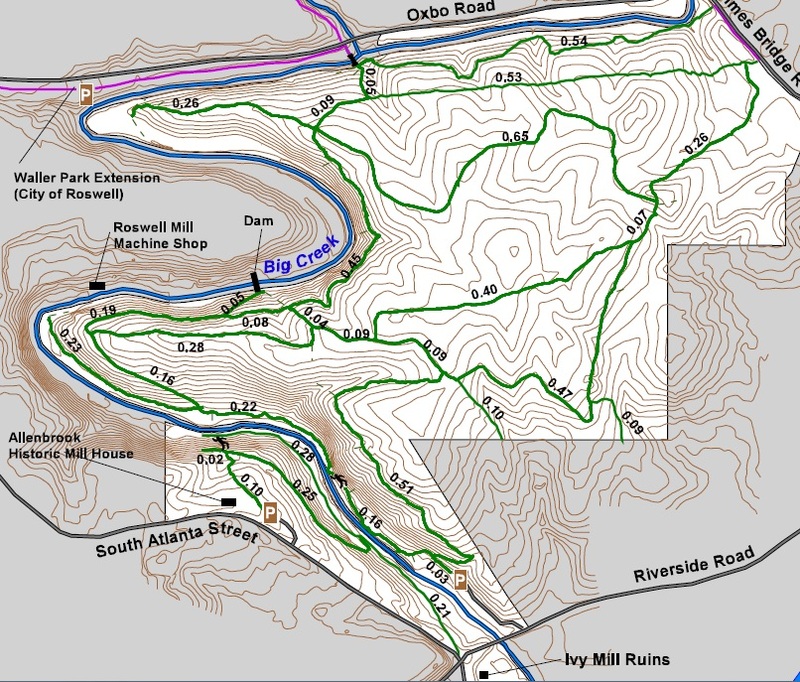 Vickery Creek is one of the largest parks in the Chattahoochee River National Recreation Area group of parks. It is a huge park (about 254 acres) and had lots of trails. Some are pretty steep hills, most are single-track, but there are trails where you can run side-by-side as well. You can run for miles out here without seeing anyone. It seems that most people just don’t run here compared to the other parks. Vickery Creek can be a fun place to run – if you know where you’re going. I went over here without reviewing the trail maps and ended up going down a trail that was closed. Instead of turning back, I decided to try to go around the closed area and ended up hiking through the woods for a while. Climbing up hills covered in foliage does not make for a fun time. Fortunately, I made it back onto the path and kept on going. Big Creeks winds through the park as well. As you run through, you will see lots of vantage points to stop and admire the view. There is a dam that is really cool – make sure to stop and check it out. This also seems to be a “make-out” point for teenagers. I seem to startle a couple of them every time I am running through. 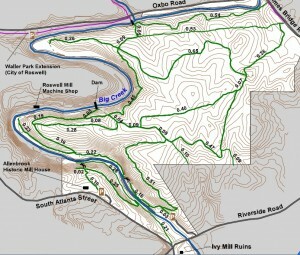 I highly recommend Vickery Creek for nice, quiet trail runs with some hills and not a whole lot of traffic.